At Ironmongery Experts, we’re proud to provide only the best in joinery and construction Accessories. That’s why our high quality keyhole protectors are available in a gigantic range of models and metal finishes. A keyhole cover can make or break the style of your door, so feel free to browse our selection at your leisure. 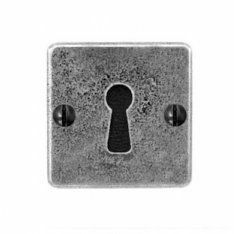 If a keyhole plate isn’t what you require, we have a collection of other components you might find necessary – for example, our Indicator Bolt locks can be applied to public toilet doors for a stylish and functional finish. We also stock various Cupboard Knobs & Handles for domestic use, as well as a large assortment of Magnetic Catches. Both are perfectly suitable for kitchen use, so which one you choose depends on the aesthetic you wish to apply. For more external uses, our Bolts & Sockets can effectively protect your garage doors from tampering and vandalism, while our Hinge Bolts will prevent your doors from being removed by their hinges for nefarious purposes. If you have double doors or French doors however, our Mortice Bolts can provide an extra layer of security to those more unorthodox door styles. If your door needs to be accessed quickly and easily by numerous users, applying a Touch Latch can be an efficient solution – designed to operate with the touch of a button, these offer a more modern alternative to a lock for your home’s internal doors. We also stock a variety of Cabin Hooks for propping open your doors, shutters and windows safely. On the other hand, our regular Hooks are best applied to hallways for hanging coats and jackets. For office and industrial application, see our range of Kicking Plates. These protect the lower portions of the door from superficial damage that may cause your door to become ugly over time otherwise. Often accompanying this fixture are our Push Plates, which provide the same protection to the higher regions of the door. Concerning Shelving, we stock both the uprights and the brackets necessary for a large-scale shelving setup. Many different sizes and configurations are available, so finding one that suits your needs is a cinch. We also offer a varied selection of Ventilation plates and panels for office and industrial use, so your air flow remains uninterrupted and safely implemented. Finally, we stock a wide variety of Safety Products for home use. These include fingershields for doors, fire door retainers (Dorgard) and even a vibrating alarm for those hard of hearing; there really is something for everyone, so you and your family can have peace of mind.